We've all deleted things by mistake. Microsoft aims to tackle this problem with Vista by adding an unlimited 'undelete' function that should enable you to rollback to any previous version of a document or deleted file. Yet until then, what can you do when you've deleted a file by accident? The file system doesn't actually remove the data, just the link to the file from your disk's index. This means that you can theoretically scan through all the data stored on your hard drive and retrieve what was previously lost. This is exactly what Search and Recover does by scanning your disks looking for patterns in the data that represents a lost file. The time it takes depends on the size of your disk - we found that a 60GB drive that was 80 per cent full and in need of defragmentation, took four minutes. The results of the search will list each file, along with any other information, such as file size and type. The list also includes a prognosis to estimate how much of the file remains. If the prognosis is good then you should get the whole thing back. Anything less and you might only get part of the document. Mounted drives and USB devices can be scanned, but we couldn't get a camera that uses the PTP protocol to work. When you accidentally delete a file, it's crucial that you don't perform any further action. This is because your Windows system believes that the disk space is now empty, and even opening an application could overwrite the space previously used by your file. For this reason, Search and Replace makes it possible to make a copy of your device, as well as launch the tools directly from the CD-ROM. These advanced features can drastically improve your chances of recovering an important file. 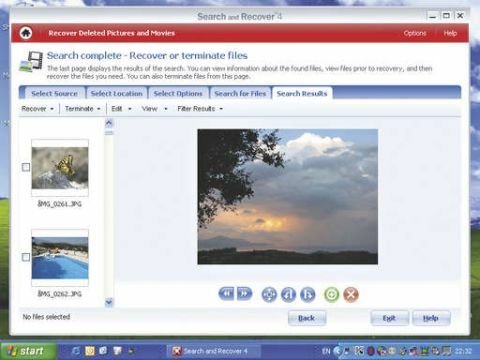 We found that Search and Replace worked excellently, and the three-machine licence makes finding lost files in a panic all that much easier.